Fragrance Notes: Fresh Cut Roses, Bergamot, Rose Essence, Magnolia Accord, White Musk, Amber. Ask me to list my favorite fragrance notes, and rose (or florals) would never figure in the list. My overwhelmingly disastrous results with trying to grow roses have contributed greatly to the dislike! I have never bought myself a rose-based fragrance, but I have received quite a few as gifts or samples and have discovered some that I actually like. Roses de Chloe is one such fragrance. Described as a luminous, subtle, and graceful fragrance, Roses de Chloe mixes the delicate scent of Damascena roses with top notes of bergamot and a cooler magnolia accord to create a fresh scent that feels especially comforting in the summers. The first note listed is that of fresh cut roses, and that is exactly what I smell when I spritz this on. I don't really discern much of the amber or white musk, probably because I am incredibly sensitive to the smell of roses and it's all I notice in this fragrance, but I do think the spicy and warm notes are what keep it from smelling too one dimensional and flat. To me, it's subtle, but these notes balance the rose essence and create a charming, sophisticated perfume that leaves a fresh, delicate, yet lingering scent on my skin - this soft perfume stays on my skin the whole day. Roses de Chloe is a delightfully light, romantic perfume that mixes the old-world charm of roses perfectly with a youthful freshness creating a girly/feminine perfume without any cloying sweetness or heaviness to it. The pure, clean notes make it a perfect spring perfume pick for me, and the fresh rose notes feel soothing and cool in the summers. Overall, a good pick for someone looking for a fresh floral perfume for warmer months...and a great gift if you are looking for something special this Valentine's. The matte lip trend started some time last year, and it has definitely trickled into 2016 with at least a couple of brands continuing with newer versions of this classic formula. 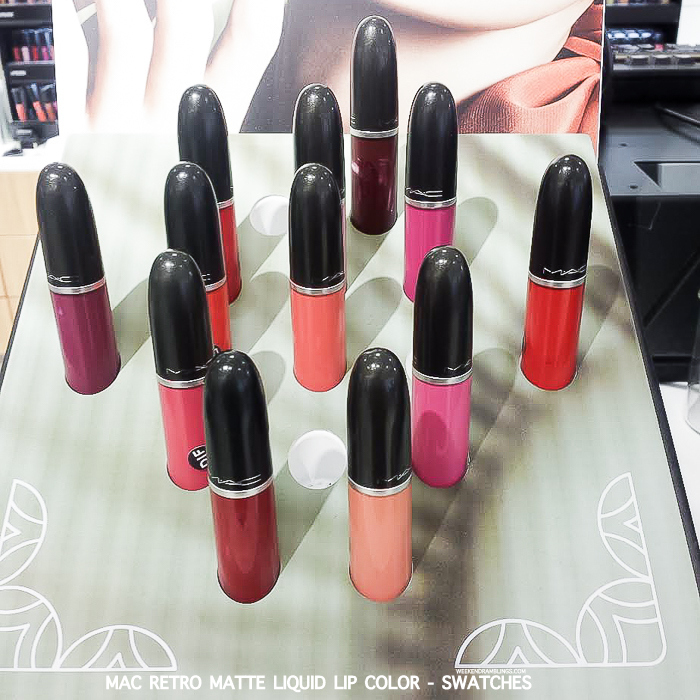 The MAC Retro Matte lipsticks have been around and popular for quite some time, and the new Retro Matte Liquid Lipcolours seem to be just as popular an addition to the range- at least going by how quickly they seem to have sold out at my local Nordstrom. These liquid lip colours are similar to lipglosses in the creamy liquid texture as well as the packaging - tube with a flocked applicator - but the similarity ends there. These liquid lipcolors are bright, pigmented, and pretty much opaque with none of the glossiness that's usually associated with a lipgloss. The finish is described as "liquid suede," and it does settle into a powdery velvety finish. The color range is mostly superbright-red-dark, but the matte finish does give most of these colors a modern, easier-to-wear look. Scroll on for swatches.